There are no better reasons for outdoor entertaining than good friends, good food and good weather. "I've made a lot of friends around the table in my life," said Rebecca Lang, food writer, television personality and author of such cookbooks as "Around the Southern Table." Lang's favorite dishes are those that are easy on the cook and incorporate Southern specialties, such as Vidalia onions. 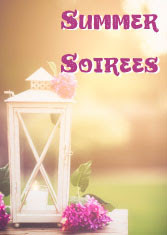 Whether you're planning for several dozen guests or inviting over a few close friends, impress them with delicious dishes in a comfortable setting. Whisk together mayonnaise, lemon juice, cayenne and paprika. Stir in pecans. Cover and refrigerate until serving. Heat 1 tablespoon olive oil in large skillet over medium heat. Cut 1 onion into half-moons. Cook onion 18 to 20 minutes, stirring often, until caramel colored. Cool and chop into 1/2-inch pieces. Slice remaining onion into 1/3-inch-thick slices. Rub with remaining tablespoon olive oil. Grill for 6 to 8 minutes per side, flipping carefully with spatula, or until softened and grill marked. Cut each slice into 3 or 4 wedges. Set aside. Combine lean ground beef, ground chuck, blue cheese, caramelized onion, salt and pepper. Divide beef mixture into 16 equal portions (scant 1/3 cup each); gently shape each portion into 3/4-inch-thick patty. Arrange patties on lightly oiled grill rack; grill 7 to 8 minutes on each side or until desired degree of doneness. Place buns, cut sides down, on grill rack. Grill for 1 minute or until toasted. Spread about 1 teaspoon mayonnaise on bottom half of each bun; top with 1 patty. 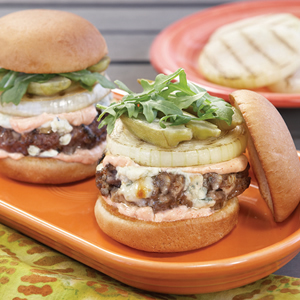 Top each slider with another teaspoon mayonnaise, grilled onion wedge, pickled okra halves, and about 2 tablespoons arugula. Top with bun tops. Secure with wooden picks, if desired. Peel and slice mangos into 1/8-inch-thick slices. Slice onions into 2 x 1/8-inch slices (julienne). Combine in large glass mixing bowl. Whisk lime juice, lemon juice, honey, 2 tablespoons olive oil, 1/2 teaspoon salt, and ginger in a small bowl. Pour over mango mixture. Cover and chill for 1 hour. Preheat grill to medium heat. Rub top of salmon with 1 tablespoon olive oil and season with salt and pepper. Grill fish, skin side down (without flipping), over indirect heat for 16 to 18 minutes, or until easily flakes with fork. Use an extra large spatula or rimless baking sheet to gently lift salmon off the grill, leaving skin on the grill rack. Stir mint into mango mixture. Allow salmon to cool for about 5 minutes. 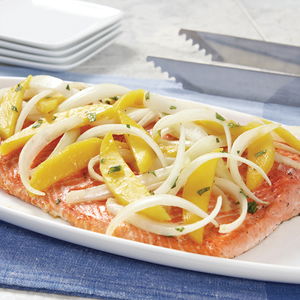 Use slotted spoon to top salmon with mango mixture, arranging down the center of the fish. Garnish with lime wedges, if desired. "Tacos loaded with color and flavor spice up a summertime cookout like nothing else," Lang said. "Arrange all the ingredients on a platter for tacos that are pretty and easy for guests to put together." Combine bell peppers, onions and jalapeño peppers in large bowl. In small bowl, whisk together lime juice, olive oil, cilantro, garlic, salt and pepper. Pour over bell pepper mixture. Marinate for 45 minutes. Preheat grill to medium heat (about 350°F). Add sausages and grill, covered, 15 to 20 minutes, turning often, until browned and cooked through. Cool slightly and cut in half lengthwise. Use slotted spoon to transfer bell pepper mixture to a grill basket. Grill over medium heat for about 10 minutes, until slightly charred. Discard marinade. Grill tortillas until warm, about 1 minute per side. 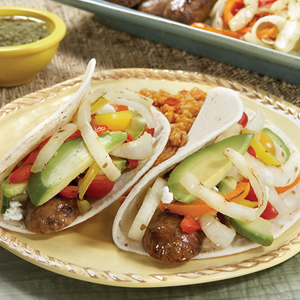 Arrange a large platter with bell pepper mixture, sausages, avocados, goat cheese, tomatoes and tortillas. Serve with lime wedges.